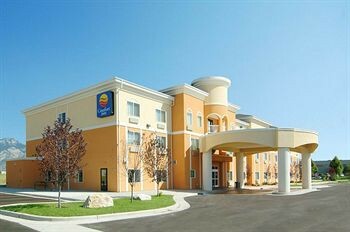 Property Location A stay at Comfort Inn Farr West places you in the heart of Ogden and within the vicinity of Ogden Nature Center and Ogden Utah Temple. This hotel is within the region of The Junction and Peery&apos;s Egyptian Theater.Rooms Make yourself at home in one of the 72 guestrooms featuring refrigerators and microwaves. Your room comes with a pillowtop bed. Plasma televisions with cable programming provide entertainment, while complimentary high-speed (wired) Internet access keeps you connected. Conveniences include complimentary weekday newspapers and coffee/tea makers.Rec, Spa, Premium Amenities Don’t miss out on the many recreational opportunities, including an indoor pool, a spa tub, and a fitness center. Additional amenities include complimentary wireless Internet access and a fireplace in the lobby.Dining A complimentary buffet breakfast is included.Business, Other Amenities Featured amenities include complimentary high-speed (wired) Internet access, a business center, and laundry facilities. Free self parking is available onsite.